In October 2012, I wrote a series of case studies on cross media projects for The Film Collaborative blog. I love following these projects because I think it is an emerging artform and those creating them are on the cutting edge of the future of entertainment. One Australian cross platform creator I find interesting is Christy Dena. She has been working on a particularly intriguing project called AUTHENTIC IN ALL CAPS that aims to bring the radio drama into the 21st century. When I first read about the project, I was a little confused because it described the project as an audio tour of the web. I whisked off some questions to her and got the full story. When you say this is an audio tour of the web…I am getting that you mean using the web to tour through your story, not that it actually leads the viewer on an educational tour of the web right? Could you explain a bit more about your story? Who is your main character and why should we go on an adventure with her? CD: “The project started with the idea of audio tours of the web. I worked on developing a startup technology business that utilises that idea. At first the plan was to release a creative project as a way to showcase what the technology can do, and open it up for anyone to create their own audio tour of the web – for educational/non-fictional or fictional purposes. The work involved in creating both a fictional project as well as a startup was huge, and so I had to make a decision which one I’d put my energy into — first at least. I decided on the creative project of course. So the idea developed away from an audio tour, to more of a radio drama layer that involves traversing specially-created fictional websites. While there are many characters in the story, you travel primarily with the protagonist and her sidekick. The characters live in a world split in two: the Overworld and the Underworld. The lead is an autopsy pathologist in the Overworld, who has a hidden life as a Philosopher in the Underworld. She is outed as a philosopher, and so attracts the wrath of the Reality Infringement Council and the excited fandom of a Part-Time Time-Travel Student. The Pathologist decides to take on a bet to find the meaning of death. She is a strong woman who persists no matter how many forces around her try to take her down. She says things we’ve always wanted to say, she does things we’ve always wanted to do. What inspired you to make this story? CD: “There are a few points of inspiration. The identity obstacles are based on my own experiences as a creative person. For years, I’ve had people putting me in boxes — oh she is an academic, she is too industry to be academic, she is too corporate to be an artist, she is too arty to be a corporate. People really need to put you in a box and while people have moved with me as I don’t seem to fit in the one they’ve assigned me, I am aware that I’ll always having people not quite understanding me because I don’t play by their rules. So far, what kinds of work has been involved in getting this project started? It sounds very thorough. What made you decide to make this iPad specific? I suppose that it will be an app in the iTunes stores globally so one could use an iPhone or iPod Touch to experience the project too? Or with the experience be particularly acute for iPad users? CD: “The choice of an iPad is resource constraint. We’re ultra indie, and so can’t afford to produce the project for all the different types of Android tablets. My original grand plan was to release on desktop and tablets. But then I realised I needed to choose one for the first release. iPad has the biggest penetration we can develop for, and iTunes gives us an existing economy people are used to. The experience isn’t suited for the phone, however, because we have websites and an interface that just won’t scale well for the really small screen. The experience is personal in that it is single player, and so the tablet is the ideal private experience platform. You are in the middle of crowdfunding this endeavor on an Australian crowdfunding site called Pozible. I have talked about Pozible in my presentations. How are you finding the experience with it? CD: “The decision to go with Pozible was a difficult one. I investigated going through Kickstarter — either in the USA or UK — for many months. I had family and colleagues who were willing to let me use their bank account (because Amazon Payments requires a local bank account). But Amazon Payments reports earnings over a certain amount to the tax office, and so we couldn’t risk that happening with family and colleagues. I discovered it is relatively easy to set up a company in the USA from overseas, but creating a bank account is riddled with financial and legal obstacles. There were also the further costs involved with using Kickstarter — Amazon Payments takes a cut, and then I’d be losing money in the currency exchange, and bank fees. Since I wasn’t asking for a large amount in the big scheme of things [$15,000], it wasn’t financially viable to go through Kickstarter and so decided on using the local platform of Pozible. Further to this, all the stats say that the majority of traffic and pledges come through Facebook – and so in this sense campaigns are platform-agnostic. But there are still obstacles. Kickstarter is the flavour of the month/year/last few years. It naturally attracts press and supporters. Press are less inclined to talk about a project on some lesser-known platform. Kickstarter is news. There is also the brand-association that comes with Kickstarter – you use Kickstarter if you’re truly international and serious. I think that is what some people think. But Pozible has been going for a few years now, and the Australian public is getting behind it more and more – though not to the degree of Kickstarter. We’re used to buying things overseas, and aren’t good at supporting our own all the time. 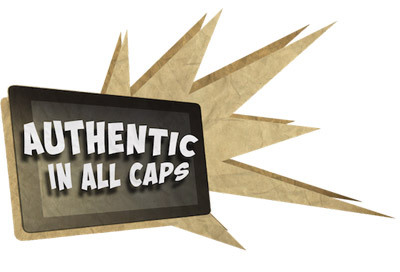 At present, AUTHENTIC IN ALL CAPS has reached the $5,000 mark in their bid to raise $15,000 with only 7 days to go. Check out their creative, animated pitch video HERE. Good luck to Christy and her team.